There's something quite special about the end of the school year - helped today by a rare glimpse of sunshine. There was a discernable lightness of mood on the walk to school this morning - the children were more energetic and noisy than usual and even the parents looked happier. It seems impossible that the Boy has completed two years at school (he was only 6 yesterday!) but there it is - he absolutely loves it, has loads of friends and is doing really well. 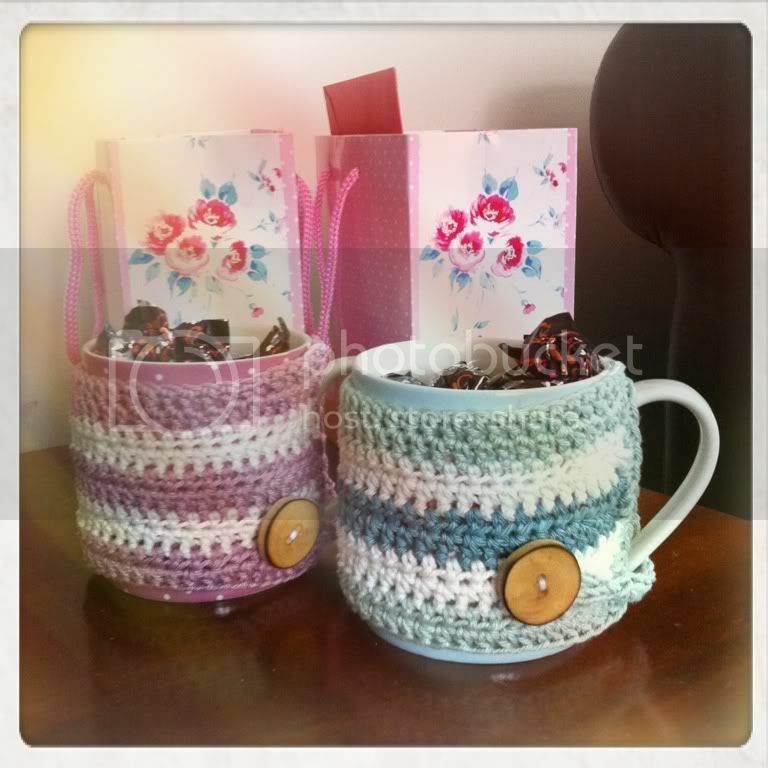 As a thank you to his Teacher and Teaching Assistant for the last year, we put together a little gift bag for each of them, including this week's 'Finished Objects' - some crochet mug cosies which I made at the weekend. The yarn and wooden buttons were from my stash, so these qualify as Year of Projects 'Stashbusting' items - I'm delighted that since the start of the month I've made various little FOs - and therefore felt quite productive - without needing to buy yarn. Very nice end of term gift! How lovely :) I did a mug cozy for the big ones teacher at Christmas. Those small projects really are satisfying aren't they? So cute. Love the way you matched up stash yarns to each mug - like they were meant to be! Your productivity is putting me to shame. Every time I get my knitting out something happens and I have to put it away again, and the one solid morning of knitting I managed, at my Wednesday Knit and Natter, had to be tinked again as I was too busy talking to properly pay attention and made a stupid mistake in the lace. I think my end of term report would say 'Could do better'! Great idea!! Might pinch this for Christmas. I hate the end of year - I feel that I have lost something and uneasy. I am loving the fact that I have my little people around me. Unlike you I have not made plans as nothing will get done for the next 6 weeks or so. Good luck with your plans!! oooh I might pinch this idea for christmas too, so cool!!!! Beautiful, the teachers will love them and every time they have a cuppa will remember your son. That is such a great idea for teacher gifts! I'll need to remember this one. Wonderful job on them BTW. I love how you matched hues of the yarn to the cute mugs. I really like your mugs and what a wonderful idea! Here in Berlin school will start again in about two weeks ... soon. Enjoy your school holidays and I wish you all the best to you and your whole family! And a great 7th year for your son! I cannot express how much I LOVE those mug cozies! You should post the pattern (please!). Such lovely gifts - the teachers will love them!